Columbian food has a slightly different, yet delicious sazón (seasoning). Sabor Latino, located on S Collins, has fresh fruit juice and everything is homemade. A perfect hole in the wall dedicated to comida Columbiana! Our order: Bandeja Paisa – a sampler of all the most famous Columbian foods. Mexican cuisine is beloved here in Texas, and Rio Mambo boasts their Tex-Mex y más, food with our favorite kind of Mexican flare. Located close to both AT&T Stadium and Globe Life Park, you’re close to all the action and ample chips and dips. Our order: Chicken Fajita Nachos with a side of guac. When I think El Salvadoran, I think pupusa. 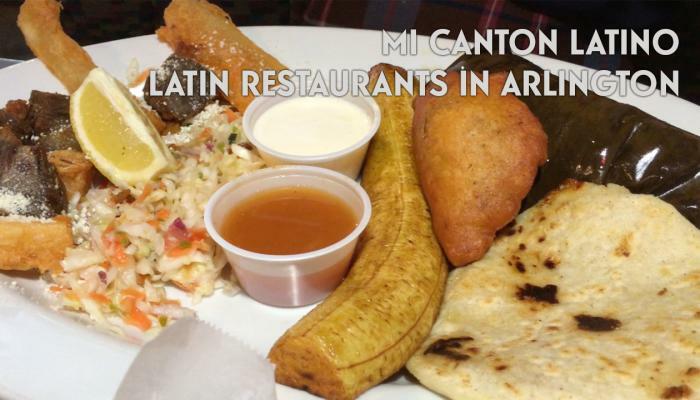 Mi Canton Latino offers so much more than that! Not only do they have killer pupusas, but the yucca, camarones (shrimp) and empanadas (among other tasty items) really sell it. Our order: The Plato Tipico, for those who want a sampler of the most popular Salvadoran fare! Blue Mesa uses the freshest ingredients around to create neo-Tex-Mex with an Aztec flair. Their black bean corn chowder, skewered meat churrascaritas and corn masa delites Adobe pies fill the menu with Latin infusion, delicious to the last bite. Also, they have a solid happy hour with their signature BLUE margaritas and great prices! El Arroyo offers tasty Mexican cuisine with a sporty vibe. With 15 flat screens and a solid margarita lineup, this would be a great place in South Arlington to catch a game. Gloria’s is a Texas chain, but don’t let that fool you. They do Latin food a solid, with flavors and styles ranging all over the Central and South American map. Like most of these restaurants, they pack a mean margarita (but get a DD, they are strong!). Our order: The black bean dip! Oh, and the Gloria’ super special – served with El Salvadoran favorites! Mariano’s is home to the ORIGINAL frozen margarita machine. If delicious Tex-Mex is your thing, you have to try out their carne asada, chicken flautas and even their tortilla soup. Our order: signature frozen margarita and chicken flautas. Honorable Mention: OK, I love El Pollo Regio(it’s Mexican fast food). I love it even more with a friend. Get a whole chicken and share it, some large sides including rice and beans with tortillas, and you have it made – for lunch or dinner.